Kidney stones are hard crystals of varying sizes that are made up of the constituents of the urine. Kidney stones are common in Australia because of our hot climate. 1 in 10 men and 1 in 35 women will develop a kidney stone in their lifetime. Stones that are formed from calcium and oxalate or phosphate are the most common stones. Struve and stones can be caused by certain types of infections in the urine. 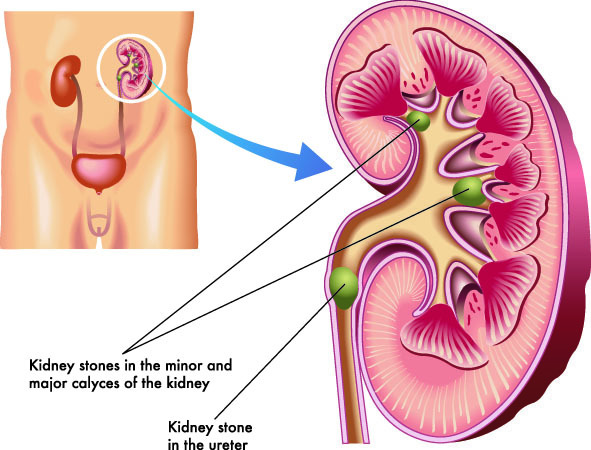 The stones can have a ‘staghorn’ like appearance and can fill up the entire kidney. Uric acid stones are usually softer and can be difficult to see on x-rays. They can be associated with medical conditions such as gout. Cystine stones are rare and are due to a inherited abnormality of metabolism of the amino acid cystine. Stones form when substances such as calcium oxalate or uric acid are in high concentration in the urine. The most common cause for this is inadequate fluid intake and dehydration. Certain metabolic conditions such as gout, hyperparathyroidism or intestinal disorders can predispose people to develop kidney stones. Some medications can increase the risk of developing kidney stones, such as those used to treat cancer, HIV, and kidney disease. What problems do kidney stones cause? Kidney stones can cause blockage of the kidney, and can predispose to serious infections and damage to the kidney. 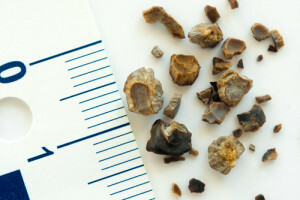 What sort of symptoms do kidney stones cause? In the initial stages of an attack of renal colic the first treatment is to give painkillers and to investigate further to see what problems the stone is causing. If the stone is small (less than 5mm) and the pain settles down, then the stone probably has a good chance of passing through by itself. If the stone and is causing significant obstruction, ongoing pain, or if there is an infection present then urgent surgical treatment is required. ESWL: shockwave lithotripsy. The stone is broken up into small fragments using shockwaves generated from outside the body. This is the least invasive way of treating stones but they must be easily visible on x rays and not too large. The therapy relies on the body passing the broken stone fragments which can be painful and result in complications. Endoscopic laser lithotripsy: A narrow telescope is passed into the bladder through the urethra (urinary passage) and the stone is fragmented with a laser. This is a common and effective way to treat all types of stones with excellent stone clearance rates. Often a ureteric stent will need to be inserted to improve kidney drainage after the procedure. Percutaneous surgery (PCNL): A track is made through the back into the kidney and the stone is broken up and fragments removed. This is more invasive and associated with more risks but may be the best option for very large stones, such as ‘Staghorn’ stones, as a lot of stone can be removed at one setting. Once a stone has been treated what should you do to prevent another attack?